There were more than 100 soldiers on all the military boats around our boat. Two small boats with cannons drew up on both sides, shouting and threatening us with megaphones and constantly moving closer towards us. Glynn the captain stayed calm and behaved exactly to principles of boat, staying on course and challenging the Navy. Yonatan and Itamar Shapira were two of the Israelis on-board the Jewish boat to Gaza, the Irene. They above all were subjected to violence from the Israeli forces who intercepted the boat. “The Israeli media is being dominated by army propaganda. They’re claiming that the take over of the boat was non-violet and quiet on both sides – but what actually happened was that the boat passengers were non-violent, but the Israeli Navy was very violent. At sunrise we stopped about 35 miles from shore and put up all the flags and banners from the organisation – the boat looked so, so pretty! We then turned south-east and headed towards the port in Gaza. Film maker Vish and journalist Eli took the dinghy and took stills and video of the boat. Everyone felt a sense of excitement as we stood on deck waving goodbye to the quiet journey we had been on. We knew that soon we would be intercepted, so we used the time for briefings. Holding each other’s hands, we talked about the principles of the boat and decided on strategies of how to deal with the Navy. When we were approximately 20 miles outside of Gaza, a big Navy warship was spotted to the north of us. At that point it was still quite far away, so we held course.As the warship drew closer they hailed us and spoke to Glyn, the captain. The Navy said that we were entering a closed area by an oil rig, so the Irene altered course slightly in response. We then saw another smaller ship in front of them. As the warship approached and drew parallel to the Irene the smaller ship remained stationary. A number of smaller vessels were spotted coming from the east. The Navy again called us demanding to know our intention – we replied that we were headed for Gaza. We waited for them to confirm that they had heard. The Navy repeated their message in Hebrew – then the boats started coming from all sides. Eight army vessels surrounded us – three or four of the ships had cannons. Itamar read this in Hebrew and English on radio a few times as the boats came towards us. Everyone was getting ready and holding hands on the Irene, getting ready for interception. Vish was in the front taking photos and filming the whole thing. The military spoke to Itamar directly and stated that he was responsible for the harm that would come to us and the risk that we were taking by not changing course. We understood very quickly that we were about to be boarded at any moment. The small boats came right up close and then the north side jumped on board. ITAMAR: As I was talking to the army boat cruising alongside us with some 20 armed, and muscled navy soldiers I was amazed for the thousandth time in my life at how the army portrays the reality to themselves and to us. They insisted that it is me personally who is responsible for the violence that may happen if we do not obey and they will be “forced” to board our little boat. I cynically tried to show them how ridiculous it seems to have so many armed, strong and trained soldiers boarding a boat with 9 un-armed people, most of whom remember the second world war and civil right movement in the 60′s, who declare non-violence. How can they portray the violence as our responsibility. I reminded them of the holocaust survivor and bereaved parent on board and that we do not want any confrontation with them. I think it made them angry but reduced their possible violence to most passengers apart from Yonatan and I. It is very important to remember that the Israeli army had killed two Gazan fishermen in the passing week with minimum media attention for getting “too close” to what the IDF has decided the blockade border is. Therefore their violence toward us must be put in proportion to this. During all the military action I was talking to Al Jazeera but I’m not sure what they have of it or what was broadcast as he was about to go on air when the phone was grabbed. They attacked Itamar and took him to their boat. The other soldiers viciously pushed Glynn from the helm. The rest were holding hands singing “We Shall Overcome.” I think Reuven may have been playing his harmonica! ITAMAR: At least 2 soldiers, to what I understood, were assigned to getting all recording devices. The Israeli Channel 10 reporter stood next to me and one of the soldiers just took his camera from his hand. I took the camera back without touching the soldier and put it behind my back and refused to give it to the soldiers. The soldier called another one and together tried to make me move with twisting arms and shouting and trying to reach for the camera. when they did not succeed they asked for a permission from their commander to arrest me. 4 of them dragged me to the military boat and forced me down to the boat’s floor in order to handcuff me. I did not give up until one of them pushed his fingers deep onto the artery in my neck, and then I heard Yonatan’s dreadful scream and saw him losing control of his body because of the electric shock he got. I shouted to Rami to throw the camera into the boat’s engine-room and Yonatan was brought to the military boat that I was on and we were both handcuffed and taken to a large ship. While we were holding hands singing the soldiers started taking over everything. At that point I was sitting on the floor of the boat hugging Glynn and Reuven, trying to decrease the risk to them, then moved to sit with Rami. On each side one of the passengers turned off the engines so as not to make it possible for the navy to steer the boat to a different place. Soldiers on boat approached me and Rami, they seemed to want to take me to a Navy boat. Me and Rami hugged each other – the strongest hug I have ever given to anyone! The officer came towards us, pulling out his taser ordered us to stop holding on to each other. The soldier threatened if I did not let go they would hurt me, then tasered me on my right shoulder and shot twice – it was very painful – but not as painful as the next shot where he pulled aside my life jacket, put gun on my chest and fired.My whole body lost control and I convulsed like a fit, I let out a high pitched scream. Then they took me to one of their boats. And that was the “non-violent” take over of the Jewish boat to Gaza. Of course if we were Palestinians or Muslims they would have shot with live ammo, but because we were Jews and Israelis and had world attention they did not want to do what they did to the Mavi Marmara. Of course later they took all evidence filmed by Eli and Vish and the only evidence which now exists is with the military and the military film itself. It would be amazing if somehow there was pressure for the army to release the media materials we shot – there’s no reason for them to keep it. It’s amazing footage of all 48 hours of the voyage and the messages we wrote on the masts and flags from everyone who had sent wishes. Probably the most powerful images are of the actual seconds when the Navy boarded the ship. 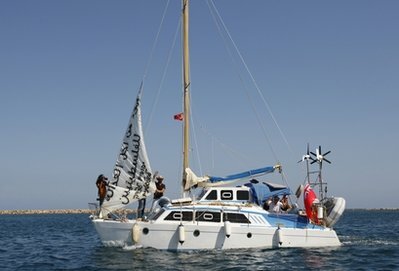 All our banners and flags were pulled down by the army and the boat was pulled with the rest of passengers on-board to Ashdod. Itamar and I went to Ashdod in the big warship which took several hours. We saw the boat being towed to the port. We saw the protesters, friends, family and supporters waiting for us on the beach since the morning, and a boat of film makers with cameras that were trying to reach us but was intercepted and forced to turn back to the port. Each one of us had an intimate body search – they touched me quite intimately but no internal search. Eventually we were taken to a police station in Ashdod and saw more demonstrators waiting for us outside. The police station took several hours, they interrogated Rami, Itamar, Reuven, Eli and I and we were all accused of trying to enter an illegal closed zone, while Rami, Itamar and I were also accused of threatening, insulting and attacking the soldiers.We were all released around eight in the evening. It was shocking to be attacked so brutally whilst hugging and singing – the soldiers shouted at us, shook and pushed us. We were shocked to hear the army say the takeover was peaceful. There was a big group of Israeli media and also people from Reuters and a few others waiting for us outside station. We answered their questions, then Reuven took out his harmonica and played a beautiful Jewish songs abut people who pursued peace. Everyone joined in around us, as we sang together some people who were passing by shouted things like “death to the Arabs”. Yonatan was not given or offered any medical attention at any point after he was shot with the taser. They were released on 5000 N.I.S bail to return for additional interrogation or court discussion. It is unclear as to whether they will be charged. These Jews were victims of the real Nazis.